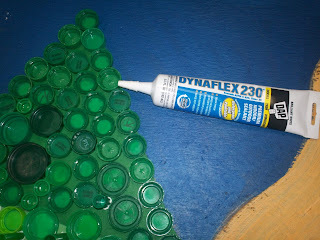 Art With Mr. E: The Capping Begins!!! So after school yesterday I spent about an hour in Home Depot reading the back of every bottle in the caulking and adhesive section. I know so many of you said to use screws, but I just didn't feel that was an option for me. Limited budget, limited ability, and limited use to power tools! Plus, I'm having students do this during classtime & pulling kids out from other classes to work on it. Using a powerdrill in my room would not be a good thing! My first thought was Liquid Nails. They use that stuff all the times in the schools here in MNPS to stick things up!! However, after reading the back...it said something about keeping out of temps below 40 degrees. I want this outside through the winter....so that is just not an option. I ended up going with DAP Dynaflex 230. 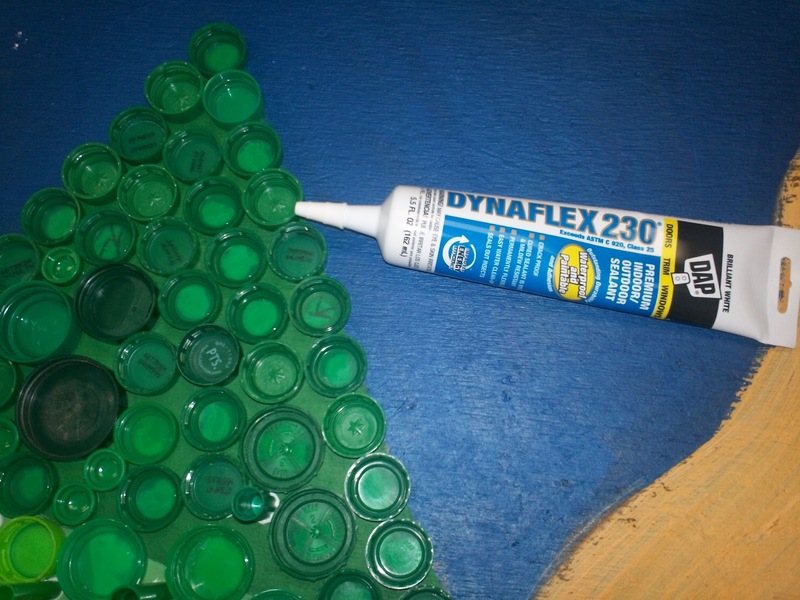 It is an indoor/outdoor sealant/adhesive/caulk. It is waterproof & paintable(so I can touch up if the kids get a little too much on the caps). I'll let ya know how it goes long term. Right now though...it seems to be stickin' them one pretty good!!! Oh...on a side note...be careful what Home Depot person you talk to about your crazy art projects!!!! The dude last night looked at me as if I had three heads...threw up his hands and said "I have no idea what would work for your artsy thing". I had two teacher kids(and also amazing artists) come in this morning and give it a try! They enjoyed it & handled the adhesive well! So exciting to see it start to come to life!! thanks for sharing all your trial and error so we don't have to!! Looking good - I like the variation in the sizes and heights of caps. Best of luck to you and your students in your mural creation. 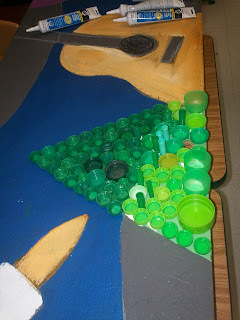 Most of our caps get collected for cash in our school, especially the milk ones! I've used an adhesive called Weld-Bond. It is great stuff. Used on a mosaic (grouted tiles on concrete, stored outside in rainy WA) and it has held up well. Have also used it on canvas (floorcloth hems) and lots of other projects. Dries clear, cleans up with water, non-toxic, and no odor (well,no more than regular school glue). I get it on-line but it is also at Ace Hardware. Can't wait to see it finished and to hear if your adhesive sticks throughout the winter. Oh my, doesn't Home Depot know at least 1/2 its customers are artists????? Hi, I am a teacher doing a very similar project and was just wondering if the sealant you used ended up working long term? Thanks! I did a pretty good job! I did not take all the stickers off the caps...so that separated from the adhesive when moisture got inbetween.